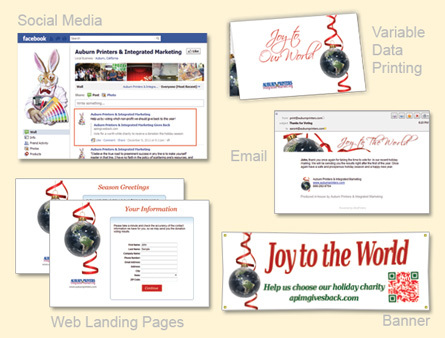 APi-marketing wanted to use some of its advanced marketing technologies to engage their clients, friends and prospects for this year’s charitable giving in 2011. They were sent a holiday greeting card with a Purl (personalized URL), followed a few days later by an e-mail containing the same information. The campaign also used a GURL (General URL) through banners, window posters and QR codes as well as social media with Facebook and Twitter. Clients could log-in to the campaign and vote for one of three choices. Once they voted, they were sent to a thank you page and follow-up e-mail with a link to that charity. Approximately 10 days later a second e-mail was sent to only those clients that did not select a charity to remind them there was “still time to vote.” Two weeks later a final e-mail was sent to all clients and prospects announcing the results of the campaign and which non profits would receive the funds. The results were better than expected, 31.8% responded to the landing page and of those, 92.6% completed a short survey updating their contact information.